Sometimes I am moved very much by the spirit and generosity of individuals at a time of great sadness for themselves. I have to say a big thank you to Sheila Stephenson who sadly lost her son John. This week she brought in a large donation collected by John’s work colleagues at Clark’s Warehouse at Watercrook who held a shoe sale to raise money in his memory. As always this money goes to help support those vulnerable adults we support through our creative activities. We have had a number of donations this year already that demonstrate how generous people can be. Claire Griffel donated proceeds from her “Imagine Senegal” exhibition, the staff and patients on Kentmere Ward gave us a big donation from sales on a table sale they held and more recently Liz one of our volunteers led an event at White Stuff in Kendal selling Valentine cakes raising lots of money from the generous Kendal public. This generosity is relied on more and more by many charities in Kendal as services are cut, budgets are squeezed, opportunities are lost to support the vulnerable. At a time when all these cuts are happening there are increasing numbers of people needing support. I think that the generosity of people, especially when faced with difficult circumstances themselves, is amazing. I don’t just count money in that. Time is as much a donation as cash. All those who volunteer their time show a generosity of spirit that bucks the trend of the prevailing attitudes among those in power that everything should be paid for and nobody should take responsibility. Here in Kendal we certainly are moving towards building a supportive community that breaks that mould of everyone for themselves”. Volunteers are our life blood and they make S2C work, make it the supportive place it is and in return I hope we give them something they need whether that be companionship, self belief or just mere satisfaction. Generosity exists with many out there and we have also been lucky to receive many very kind donations of resources and art materials. Generosity takes many forms and it turns out to be quite easy and very rewarding no matter with whom that is. Money, time, resources, food, a kind word, a helping hand, a positive comment, spreading the word about a charity, liking posts and sharing them on Facebook…….it all adds up. “You don’t have to be mad to work here”, but frankly, the current state of provision towards mental health and the attitudes of some in this country is unhelpful, to say the least. It feels like Space2Create is getting somewhere, we are offering more sessions, some new faces, our local paper has written some nice articles about us, and in the last few last weeks we’ve been kindly invited to events that raised some cash, some big cheques have been handed over thanks to some dynamic individual efforts and some great teamwork, last year we sat in a prestigious awards ceremony (we didn’t win, but still nice to be part of it) and all this is due to several factors. The constant drive of management and core team, pushing the project forward, opening the gallery in the rain on a day when there might be no visitors, or putting personal problems aside to come in and do a shift in a workshop. The kindness of our friends, contacts and other groups who donate equipment, car space, money and especially their time, to help us put on a show, share theirs skills and techniques, run a stall, sell something and donate to the cause. Our volunteers are a wide range of individually talented and dedicated people with their knowledge and skills, and especially their time, together we can do anything. Working with other groups and organisations in collaboration, sharing resources and linking up with other like-minded individuals and teams who might help us to push the project forward and raise our game. Collaborations will be important in us moving forward, and together we can help more people. Kendal is a small town, with some very dedicated individuals and teams working hard to bridge the gaps where people need help, this is achieved on little or no money and is driven by love and a need to help and share. As always, we need volunteers to achieve this, people with some time, skills and kindness. If you would like to volunteer, drop us a line and we can arrange a visit. Come and see what we do. We also desperately need an accountant, to help us move on to our next challenge, if you are, or know of anyone who might fit the bill, please contact us via email, Facebook or phone us. Thanks for the support. Running group sessions for people who have a long term illness or mental health conditions is always going to be a tricky balancing act. The balance between an individuals need to express their issues and talk about what they are going through as opposed to the needs of the group who might be affected by what that person says. Sometimes it can be particularly tricky where one person is very vulnerable and sensitive and another is expressive and vocal. To allow the former to continue risks real harm to the first in that their mood or condition can be disrupted. That is why we need volunteers in the group, not just the odd one but plenty so there is a good ratio. People can often feel that just being a volunteer to sit in the group and take part is not really volunteering but it is in fact a vital part of the sessions. We need those people in the group to help both ends of the spectrum, the vocal and the withdrawn. The easiest part of the role is modelling. Showing how to be positive and have a go, interact with the group socially, how to behave around people and what is appropriate or not. It is surprising how many people struggle in this kind of situation either through their own isolation or through their medical condition. Then there is the part of the role where you might be sat alongside a very quiet or nervous person and the role becomes one of encouraging and supporting, using your judgement to decide if that person needs encouragement to engage or if just being with them and letting them know you are there if they need you. I have sat through an entire session next to a person and barely spoken with them other that the odd word and they have left thanking us for our support and how much better they feel. It takes weeks sometimes for people to interact more. It might be that you are working alongside a more vocal individual. In this case it may be that rather than pronouncing their problems to the whole group, these individuals need channeling and engaging one to one at a lower volume that is for conversation between people sat next to each other. Using your judgement to decide if that person should be withdrawn from the group for a time to talk privately. S2C always tries to have a more senior volunteer on hand if it is felt the individual needs more support they can go to another area to talk privately and try and resolve issues or just talk about them confidentially. What we want to avoid is the situation where one individual, who clearly needs support, very loudly and innocently is dominating a group by exploring their issues with the whole group. At times this is inappropriate and it also impacts on other members of the group. It is all part of the group management to best achieve what is needed for everyone. Some will be there so they can quietly be part of the group and some will be there because they need to talk to somebody about their situation. Our role is to ensure both have what they need to improve their wellbeing. If you would like to volunteer with S2C then get in touch. We are looking at developing new sessions and improving our existing ones as well as developing better structure for the charity, This means we need all sorts of volunteers from artists, group supporters, admin, a treasurer, fundraisers, event helpers, exhibition helpers and more. Kentmere Ward, a special relationship. The Kentmere Ward at Westmorland General Hospital provides an essential service to our community in supporting the most vulnerable patients in mental health crisis. The town has had to campaign hard to make sure it continues and it is with good reason for the fantastic job the staff there do to help people back to a point they can begin to recover. 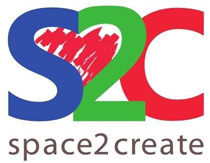 Space2Create has been very proud to work closely with the Kentmere Ward for as long as we have existed (last five years) and before when a group of us who are now with S2C went to the ward from the Charity Workbase before it closed. So in effect we have been running creative sessions on the ward now for getting on eight or nine years. These sessions are not in themselves demanding or clinical. They are what they are but are highly valued by the people in the ward, the staff and the patients. They add in the value of a positive experience helping to boost confidence and mood for the patients. They help with passing time, as many will know, which is one of the difficulties of being on the ward, keeping occupied. They help build relationships, both within the ward between participating patients and staff, but also with the outside world and the volunteers who regularly give their time to the project. It provides a stepping stone for the patients on the ward to then have confidence to come to sessions at S2C or indeed to engage with other charities for support when they leave the ward. We also provide resources and ideas for creative activity the ward might not normally have access to. And then there are those special moments when someone who has previously been a patient on the ward in crisis, has left, come to S2C as a service user, then as a volunteer and when ready gone on to volunteer for the ward sessions giving back to those on the ward the support and care they received. I have two big big thankyou’s in this. First to the staff at the ward who very generously,ients, donated over £200 pound raised from a table sale they held of items made on the ward. The second is to Sue G who has been doing the ward since the very first sessions with Workbase and with S2C and who has very much kept the sessions going when we have been very short of volunteers to help us. If you would like to hy becoming a volunteer and giving your time to go and be creative on the ward, listen and chat to the patients then please get in touch with us via email info@space2create.co.uk or call 01539 482540.